The Motivation Expert™ Jim Cathcart, CSP, CPAE can show you how! September 27, 2018 MENTORED.COM launches the Cathcart Institute “Relationship Intelligence® Certification courses. Register now to view one of the lessons for FREE. Click here. September 21, 2018 Jim Cathcart delivers a keynote at the Thought Leaders Summit at the old Hollywood Roosevelt Hotel and receives the Quilly® Award for being the best selling author of 19 books including his latest, a collaboration called The Will To Win. As a speaker, Jim Cathcart was selected as a 2017 Top 25 Speaker (#9) out of 1,300 speakers in an online survey by Speaking.com. 27,000 people voted in this survey to isolate the Top 25. This is the 3rd year in a row that Jim achieved this ranking. Designated as the first “Entrepreneur in Residence” by California Lutheran University’s School of Management since late 2016. Chosen one of the Top Sales Influencers of 2014, 2015 & 2016 by Top Sales World Magazine based in London & Paris. In December of 2012 Jim Cathcart was inducted into the Sales & Marketing Hall of Fame in London, England. This is in addition to his existing Speaker Hall of Fame listing. With over 40 years of professional speaking around the world, Jim Cathcart is one of the best known and most award-winning motivational speakers in the business. He has delivered more than 3,200 presentations to audiences in every state of the US, most provinces of Canada and countries from Scotland to Singapore. Some of his most recent international engagements were for tens of thousands of business leaders in Taiwan and Mainland China; hoteliers in Bali, Indonesia; engineers in Toulouse, France; business owners in Bogota’, Colombia; Costa Rica; Panama; sales people in Warsaw & Wroclaw, Poland; Santiago, Chile and Macau, China! A business strategist, psychological researcher and philosopher at heart, Jim is also a down-to-earth regular guy. He has worked in warehouses, driven trucks, sold door to door and at trade shows, been a bank teller, plays guitar in night clubs and pubs, and has toured much of the world on a motorcycle. A TV interviewer said, “Jim Cathcart is what ‘Fonzie’ would have been if he’d gone to business school.” (Millennials are asking, “Who is Fonzie?”) Jim was an insurance agent for many years, an Army officer and a bill collector who, while in his twenties, had to repossess log trucks in the mountains of northern Arkansas. From this varied background he decided in 1972 to become an authority on the subject of motivation and through decades of dedication, study and hard work, he made it happen. And even today, he’s also an active motorcyclist and guitar performer. Who has hired Jim as their speaker? Brace yourself, this list is longggggg! Client List by Industries. Read (Click here) What Jim’s Clients, Customers and Colleagues have to say about him. EVEN JIM’S FELLOW SPEAKERS HIRE HIM! Here’s just a short list of the other speaker friends and authors who have endorsed Jim (in many cases they have also booked Jim to speak at their own events): Brian Tracy, Jack Canfield, Tom Hopkins, Todd Duncan, Les Brown, Ken Blanchard, Nido Qubein, Spencer Johnson, Daniel Burrus, Norman Vincent Peale, Zig Ziglar, Stephen Covey, Og Mandino, Earl Nightingale, Charlie “Tremendous” Jones, Tony Alessandra, Gerhard Gschwandtner, Jeffrey Hayzlett, Randy Gage and Cavett Robert. Today he is listed in the professional Speaker Hall of Fame, is a recipient of the prestigious Golden Gavel Award (along with Earl Nightingale, Art Linkletter, Zig Ziglar, Tony Robbins and many others), has been the president of the National Speakers Association and received the Cavett Award for a lifetime of service. He has authored 19 books and scores of recorded programs. In 2014, 15 & 16 he was listed as one of Top 50 Sales Influencers in the World by Top Sales World. 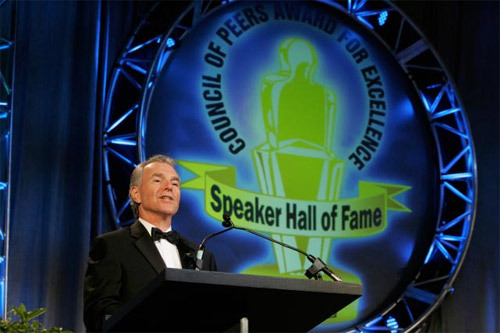 The San Diego chapter of the National Speakers Association renamed their member of the year award “The Jim Cathcart Service Award” and the Greater Los Angeles chapter gave Jim the Lifetime Achievement Award in 2003. In 2008 he was inducted as one of the “Legends of the Speaking Profession.” And in 2010, 2011, 2012, 2013 & 2014 he was selected as one of the Top 5 Sales & Customer Service Speakers by Speaking.com in an online survey of over 27,000 people. Jim Cathcart is an active motivational speaker and prolific author plus an executive coach to numerous high-achievers. In his personal time he plays Rock & Roll guitar in clubs, rides his motorcycle on the twistiest roads he can find and runs the trails of the mountains near his home at least twice each week. He’s a proud parent and grandparent and an active civic leader. He is an Artist in Residence for High Point University and serves on the Dean’s Advisory Council and Adjunct Faculty of the School of Management at California Lutheran University. His messages can be seen daily on Thrive15.com and TSTN.com or YouTube and he does radio interviews almost every week.